The 5th hole at the Highlands, one of two courses at Hampton Cove. 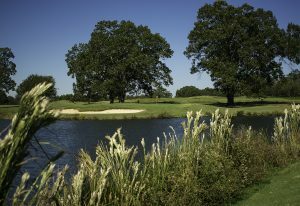 Don’t look now, but the state known for its championship college football teams and a movie character named Forrest Gump has not-so-quietly become the golf capital of the Deep South, thanks to the famous Robert Trent Jones Golf Trail, which now boasts 468 holes at 11 sites from the Gulf of Mexico to the Tennessee border. 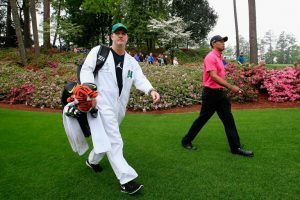 But zero in on North Alabama golf in particular and you’ll find a region that’s blown sky-high, literally and figuratively, as a must-visit both on and off the course and far beyond the Trail itself. In fact, filling a solid week with memorable rounds on lovely, well-maintained courses of surprisingly varied character — some of which aren’t formally RTJ Trail courses — in a geographic triangle from Scottsboro to Muscle Shoals to Birmingham is no stretch whatsoever. And if you’re a fan of locally, lovingly brewed lagers, ales, hefeweizens and porters (who isn’t these days? ), the eight breweries that make up the North Alabama Craft Beer Trail will keep you hoppin’ with a smile from round to round. Work in a wide array of lodging and dining options — from upscale group-friendly cabins to well-appointed hotels and down-home seafood and barbecue joints to higher-end culinary showcases — and you’re all set for a swinging, swilling, finger-licking foray of fun. Let’s start in Alabama’s northeast corner and “roll tide” from there. Hampton Cove, whose 36 holes are the northern gateway to the RTJ Trail, went online back in the early 1990s on the outskirts of Huntsville — called “Rocket City” for the NASA U.S. Space & Rocket Center, where full-size models of the Saturn V and Space Shuttle stand proudly next to the interstate, drawing thousands of skyward-looking would-be astronauts every year. It’s not clear if the German physicist who helped America reach the moon in 1969 ever picked up a golf club, but chances are he’d have loved Hampton Cove’s two very different routings — the rolling, bunker-studded Highlands and the utterly bunkerless River Course. The Highlands is Trent at the top of his resort-golf powers, conjuring a showcase of nifty, muscular-but-playable holes through a handsome subdivision of stately brick homes. Most of the front nine is tree-lined and more than half the back nine breaks into an open, flatter mix of lakes and meadows. Conditioning is excellent (though the greens can be a bit on the slow side at certain times of year) and there’s no dearth of memorable holes, especially No. 5, a short par 4 bisected by a creek squarely in the driving zone, with an old “mule barn” guarding the right side. The back nine’s opening stretch offers the best opportunity to go low if you play the proper tees (white in our case), as long as you do your best to ignore or work your way around and over several water hazards. From the tips it’s a Tour-caliber beast (over 7,400 yards), and college studs from local University of Alabama-Huntsville have been known to venture back that far into the shade, but the rest of us should move up, order up from the well-stocked beverage cart (serving a few local crafts, of course), and tally up the gratitude for getting to know a Southern belle of this architectural breeding. The Digs: Doubletree Suites is a popular jumping-off spot for golf groups in Huntsville. The poolside lounge area is outstanding for a post-dinner cigar and a cocktail or two and the buffet breakfast is a cut or two above regular chain hotel fare. The Chow: Downtown is packed with dining options but craft beer heads can’t beat the hop-scented complex built around Campus 805, an old middle school. Built from a consortium of home brewers who turned their passion into big, gleaming tanks that pump out year-round beers, Straight To Ale offers Saturday tours, a tasting room, shops, food and its own Ale’s Kitchen (burgers and wings, oh yeah). Across the way, Earth and Stone Wood Fired Pizza, located inside Yellowhammer Brewery, puts out a great artisan pie from a wood-fired oven plus plenty of great bar food staples. Close to an hour’s drive east of Huntsville is Scottsboro, home to perhaps the most unique retail operation in America, Unclaimed Baggage, in which 70 percent of the merchandise is just that — mostly carry-on luggage and items left on planes, then purchased, after the legal waiting claim period, from airlines. About a third of these items are given away, a third are thrown away and a third are resold. More than a million people come from all over the world to shop there each year, nabbing everything from jewelry and electronics to brand-name apparel at discount prices (one writer picked up a sweet leather jacket; others grabbed books and golf wear). Over 7,000 new items hit the shelves every day. Save some room on that credit card for a round and perhaps a stay at Goose Pond Colony Resort. Situated on pretty Lake Guntersville, Goose Pond is folksy and semi-rustic, though the cottages are spacious, smartly if straightforwardly outfitted. The lodge has single rooms, some with kitchenettes. The small pro shop and grill have a hilltop view of the practice facility, first hole, water, woods and hills. Designed by George Cobb in 1971, the Lake Course plays out onto a peninsula, around two lakes, with the feel of a friendly muni but the chops of a higher-end resort course. It’s not an official part of the RTJ Trail but it very well could be, with its quartet of strong par 3s (No. 16 is as hefty as it gets, some 223 from the tips over water), gently turning and mildly hilly, tree-lined par 4s and 5s, and vistas you get few other places, including a large multi-spoked marina packed with bass fishing rigs and a few nifty cabin cruisers (the state’s largest fishing tournament takes place in these waters). There’s a second course not far away, The Plantation, that was acquired a few years ago, but the Lakes is the one to play. Fighting Joe at The Shoals near Muscle Shoals, Ala.
Elvis Presley was famously from Tupelo, Mississippi, which isn’t that far from the northwestern ’Bama twin towns of Muscle Shoals and Florence — one known for attracting the world’s best blues, rock and country musicians to its fabled recording studios (Nashville is just a couple hours away), the other for a simmering stew of fine cookin’ and Southern hospitality. It’s also where a one of two great golf courses at The Shoals pays tribute a singular American warrior named Joseph “Fighting Joe” Wheeler. Wheeler was that rare warrior who fought for opposing armies, though not at the same time. 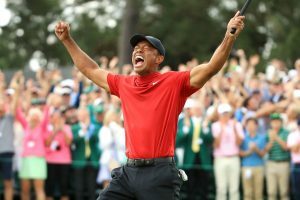 Born near Augusta, Georgia (ring a bell, golfers? ), he was raised in New England and graduated from West Point, but resigned his Union post and joined the Confederate Army in 1961 as a Second Lieutenant, took command of the 19th Alabama Infantry Regiment out of Huntsville, and went on to battle with distinction throughout the war. In 1880 he was elected to the U.S. House of Representatives as an Alabama Democrat, and Decades later, well into his 60s, he volunteered for the United States Army and fought in both the Spanish-American War and Philippine-American war. 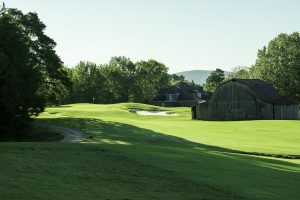 Retiring to New York, he penned several books on battle strategy and military history, and after his death in 1906, several landmarks in his native South were named after him, but not a golf course — until 2004, when Alabama’s Golf Trail added 36 holes at The Shoals — an “inland links”-flavored 18 called Fighting Joe, the other called The Schoolmaster. The Digs: If you want the most refined dose of Florence hospitality, stay at the Marriott Shoals, where every suite offers a river or pool view, or both, with a separate tower housing a small but full-featured spa down below and a slowly revolving restaurant up top. The Chow: Head downtown to a main street scene right out of Sinclair Lewis and take in some top-notch continental fare at Odette — steak, seafood, pork, poultry, inventive salads and appetizers, all locally sourced and prepared, writes chef Josh Quick on the eatery’s website, by marrying “international flavors with regional flare.” Even the deviled eggs get a unique touch, served “two ways,” while the fried brussels sprouts or okra, catfish fillet and pan roasted grouper keep the South in your mouth, big time. TP Country Club, Cullman, Ala. The Shoals marks the most northwest reach of the RTJ Trail, meaning it’s time to head south, in this case to the semi-sleepy town of Cullman and its off-the-beaten Trail course, TP Country Club. Semi-private and family run, the Tom Jackson-designed course that is well worth a detour. 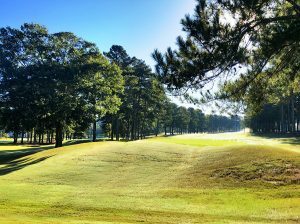 The clubhouse sits on the highest point in Cullman Country, with 18 loblolly pine-studded holes spreading out below it. This is the hilliest collection of holes you’ll most likely play in North Alabama, with elevation changes that rival most mountain courses in the West or Northeast — call it the Everyman’s Augusta, Alabama style, with incredibly fast and subtly contoured greens and more than a few ponds, with wetlands working their way into the fun on the front nine. The finisher is a straightaway par 5 that’s reachable in two if you’re playing the up tees or can really bust it from the back, but beware the big oval of agua about 50 yards short of the elevated green. TP Country Club is straightforward, sturdy golf and a blast to play, but what really pushes it into must-visit status is the hospitality from Director of Golf John Hunt and his crew — a reflection of the golf-loving spirit of the 91-year-old owner and his army of members, one of which, 97-year-old Julian Campbell, still plays three times a week and has carded more than 5,000 rounds total. Also home to Bob Kurtz, a retired pastor and “Golf’s Iron Man” who once played 1,850 holes in one week and the fastest 72 holes ever played — 3 hours and 5 minutes — at TP, with the final 18 only taking 42 minutes. We advise stretching your own round a bit, enjoying the course’s flow and friendly quirks, and making the most of a day here. The Digs: Check into an overnight at aa secluded wedding-and-big-group getaway spot called Stone Bridge Farms, with its collection of multi-bedroom ranch-style cabins (including the one-level Villa Rica, former residence of CEO Ron Foust, with an outstanding pool/patio spot complete with built-in stereo), and the elegant two story Manor situated on its own 75-acre estate. There’s an event room/dining area called the Carriage House, plus another restaurant mostly reserved for events but serving a buffet dinner on Thursdays. The Chow: Dig into some killer ’Bama ’cue courtesy of Jim ‘n’ Nicks BBQ, a seven-state chain. Each menu is tuned to its region; in Cullman they grow monster racks of baby back or spare ribs (and riblets for the less hungry), plus chopped pork, brisket, hot links, chicken and turkey breast; the sides run the gamut from spicy-sweet slaw to collard greens to can’t-say-no onion rings. The double decker sandwich piles on the pulled pork and brisket, and the go-to dessert, banana pudding, is off the (diet) charts. Leave this joint hungry and it’s your own damned fault. 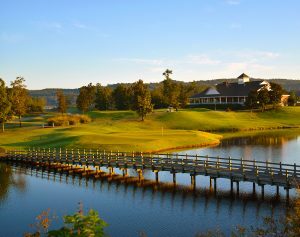 Silver Lakes Golf Club near Gadsden, Ala.
About a 90-minute drive northeast of Birmingham and its very convenient airport is another fine, hilly outpost called Gadsden — home to Back Forty, the state’s largest craft brewer. Founder Jason Wilson will talk you up a red streak on his baby’s story, and with 22 people pounding out the suds to seven southern states out of its 27,000 square foot facility, with more on the way, Back Forty is bound for bigger glory — on their own sweet Southern and surprisingly progressive terms. You’ll need a bracing brew or two to take on Silver Lakes, what might be the toughest three nines on the entire RTJ Trail. 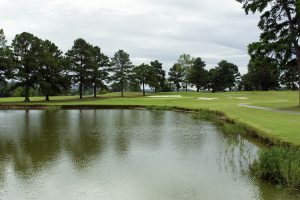 The aptly named Heartbreaker, Backbreaker and Mindbreaker nines also might comprise the senior Jones’ best work overall on the Trail’s northern circuit, though these 27 holes — with a par 3 course kicker — are as different from their original incarnation as North Alabama is from the south half of the state. A 2011 tornado ripped out thousands of trees; after some debate on whether the course would reopen at all (thank God it did), the work was put in to make its newly “open” setting as complementary to the original design as possible. Mission accomplished: from the opening tee shot slightly downhill to a broad fairway followed by a layup and final, sharply uphill approach to a huge green (a theme that would be repeated many times), this is big boy golf, broad and muscular and fraught with just-off-the-fairway danger, mostly in the form of deep grass but also water hazards, stout bunkering and copious sidehill lies. The greens are near-perfect, rolling true and testy. If you play the Heartbreaker-Backbreaker combo you’ll come away thrilled if beaten up a bit, though going low is doable with some patience and a favorable bounce here and threre. One a recent visit, one golfer’s birdie on the final hole — a reachable but dangerous par 5 that swoops down a hill, then back up and over water — put the place in a giddy, too-bad-this-is-the-end light. The clubhouse is big and well-appointed with showers and a fine locker room, with a grill serving fine sammies and salads. The Digs: Chain hotels rule these parts, with the likes of Hampton Inn leading the way. It’s convenient to the main road and Silver Lakes itself, which makes for the perfect first or final track on your North Alabama adventure, depending on your flight plan. The Chow: High time for an epic seafood gorgefest at Top of the River, where catfish is king but shrimp, crawfish, chicken and steaks get their due, too. Fried is the preferred preparation but boiled and pan-roasted are fine options. The cornbread is amazing. Fried dill pickles a great choice for appetizer and the Chocolate Beyond Reason pie will push you over the sinful dessert edge. Jonesing for a shot at North Alabama golf yet? Of course you are, and there are stay-and-play deals and group rates to be explored and enjoyed. Visit www.northalabama.org for more information.